Even though he grew up in sunny Burbank, California, you just know Tim Burton was a weird kid. After all, we’re talking about someone who started making movies before puberty, as well as spending the rest of their time immersed in the works of Edgar Allan Poe and Vincent Price. In another life, Tim Burton was probably one of the goth kids on South Park. In case you’ve only seen a few of the Tim Burton movies available on Blu-ray and DVD, this list will provide a handy reference guide for other bizarre masterpieces from a true original. Oingo Boingo fans should be especially delighted. Big Fish (2003) – Burton lost both of his parents within the span of two years, which makes this film one of his more personal projects. Based on the 1998 novel from Daniel Wallace, Big Fish centers around Edward Bloom (Albert Finney/Ewan McGregor), a former traveling salesman with a love for weaving tall tales. Now on his deathbed, Edward is visited by his estranged son (Billy Crudup), and the younger Bloom struggles to understand his father while listening to his exaggerated life story. Adults will enjoy the complex and evolving father/son relationship, while kids will get a kick out of the fantastical creatures ranging from witches to werewolves. A touching tale for all ages, Big Fish boasts an impressive cast that includes Jessica Lange, Helena Bonham Carter (of course), Steve Buscemi, Alison Lohman, and Danny DeVito. 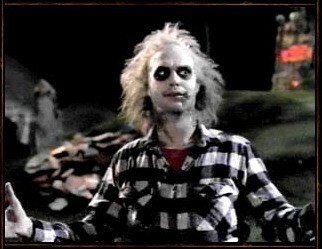 Beetlejuice (1988) – Before he was tossed on the Hollywood scrap heap, Michael Keaton was one of the finest comedic actors in the business. His abilities are displayed perfectly in the role of Betelgeuse, a lowlife ghost who specializes in terrifying the living. His latest clients are the Maitlands (Geena Davis and Alec Baldwin) a recently-deceased New England couple who can’t stand the pretentious yuppies (Catherine O’Hara and Jeffrey Jones) who’ve purchased their dream home. Winona Ryder, the cinematic darling of the late ’90s, co-stars as a goth teen who can see the dead and becomes caught up in Betelgeuse’s plans. This is Burton at his most unusual, littering the screen with bizarre lighting, eccentric characters, and a heavy dose of Harry Belafonte tunes. Ed Wood (1994) – The real-life Ed Wood Jr. made awful low-budget movies, liked to dress up in women’s clothing, and had a thing for angora. Yep, sounds like the perfect subject for a Tim Burton film. Johnny Depp stars in the title role, playing Wood as an eternal optimist dedicated to making a cinematic masterpiece just like his idol Orson Welles. While Wood lacks any real talent, that doesn’t keep him from soldiering on, filling his sci-fi and horror films with actors and acquaintances ranging from transsexuals (Bill Murray) and pro wrestlers (George Steele) to morphine-addicted horror icon Bela Lugosi (Martin Landau in an Oscar-winning role). Burton never takes the easy way out when dealing with the much-maligned director. Instead, he celebrates Wood’s films and his strange circle of friends, turning the project into a love letter aimed at all those who fail to achieve their dreams but bravely persist. Batman (1989) – Following their collaboration on Beetlejuice, Burton again cast Michael Keaton…this time in the role of the legendary comic book protector of Gotham City. Fans went batshit, convinced that the actor couldn’t pull off the part. They were wrong, of course, and Keaton demonstrated his versatility by walking the fine line between billionaire Bruce Wayne and the grim superhero. Jack Nicholson also drew praise for his role as The Joker, a zany madman who seems positively harmless when compared to Heath Ledger’s later portrayal in The Dark Knight. Prince did the soundtrack, Kim Basinger stars as the love interest, and Burton makes sure that everything is suitably dark and gloomy. It hasn’t held up well over the years, but it still beats the hell out of Joel Schumacher’s dreadful Batman & Robin. Mars Attacks! (1996) – Back in 1962, Topps released a series of trading cards showing Martians invading Earth and slaughtering the locals in unique ways. Thirty-four years later, Tim Burton assembled an all-star cast and turned out this satirical and ultra-violent adaptation featuring Jack Nicholson in dual roles and Sarah Jessica Parker getting her head grafted onto a dog. Other stars include Jim Brown, Natalie Portman, Michael J. Fox, Pierce Brosnan, Glenn Close, Annette Bening, and singer Tom Jones. Delightful chaos from start to finish. Pee-wee’s Big Adventure (1985) – It seems fitting that Tim Burton owes his movie career to Pee-wee Herman, the bizarre man-child portayed by comic Paul Reubens (who personally selected Burton after seeing his short film, Frankenweenie). The plot is simple: Pee-wee has his prized bicycle stolen and embarks on a nationwide search to find it. Along the way, he dances for bikers to the tune of “Tequila,” visits the basement of the Alamo, wanders into a Twisted Sister video shoot, and hitches a ride with a ghost. The offbeat subject matter melds perfectly with Burton’s distinct and still-evolving visual style, creating a comic concoction that’s oddly infectious. Skip the sequel, though. Sleepy Hollow (1999) – In 1799, the tiny town of Sleepy Hollow is being plagued by a series of murders. The victims have had their heads cut off, and all the locals attribute the killings to the ghost of the Headless Horseman (Christopher Walken), a Prussian mercenary who died during the Revolutionary War. Officials in New York City get wind of the crime and dispatch geeky forensic expert Ichabod Crane (Johnny Depp, naturally). During the course of his investigation, he falls in love with a local gal (Christina Ricci), but can he solve the mystery before she becomes the Horseman’s next victim? The creepy sets rightfully won an Oscar for Best Art Direction, and the fine supporting cast includes Michael Gambon, Miranda Richardson, Ian McDiarmid, and Christopher Lee. Sweeney Todd: The Demon Barber of Fleet Street (2007) – Burton continues his trend of adapting previously released material, this time focusing on the 1979 musical from Stephen Sondheim and Hugh Wheeler. 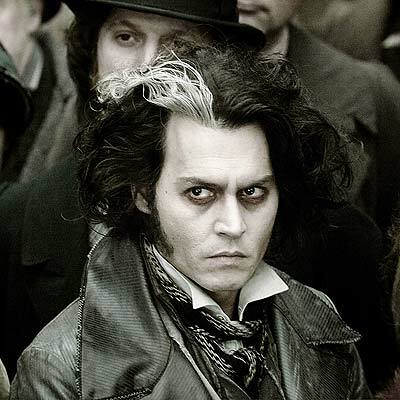 Johnny Depp plays the title role, a deranged barber who returns to London to exact vengeance on the corrupt judge (Alan Rickman) responsible for the disintegration of his family. Opening up a business, Todd begins cutting hair and slitting throats, dumping the bodies down a hole to be turned into meat pies by his crazed accomplice, Mrs. Lovett (Helena Bonham Carter). There are a number of wicked twists and turns during the final act, and fans of musicals should enjoy Depp’s vocal efforts. Viewers who are squeamish about blood should be warned, though, as Sweeney Todd’s straight razor draws copious amounts of the red stuff. Charlie and the Chocolate Factory (2005) – Johnny Depp and Burton team up once again, this time for the second big-screen adaptation of Roald Dahl’s 1964 novel. Depp stars as Willy Wonka, the reclusive–and highly eccentric–owner of a leading candy company. When he announces a contest to allow five people to tour his chocolate factory, everyone scrambles to buy a Wonka Bar and find one of the five golden tickets. All the winners are children, including the well-mannered Charlie Bucket (Freddie Highmore), a likable boy who lives in poverty and dreams of a better life. Depp’s Wonka is a childlike goof with daddy issues and massive white teeth, but the real stars are the Oompa-Loompas, diminutive workers–all played by actor Deep Roy–who sing tales of morality following various misdeeds by each child. Edward Scissorhands (1990) – Burton takes a look at his adolescence in the suburbs through the eyes of Edward (Johnny Depp), an artificial man who’s left with scissors for hands due to the death of his creator (Burton’s hero, Vincent Price, in his final role). After spending years alone in a creepy mansion on the hill, Edward is discovered by a perky Avon rep (Dianne Wiest) and taken to the burbs where he promptly becomes smitten with her teenage daughter (Winona Ryder). Of course, the naive Edward also runs afoul of some of the locals, including an amorous housewife, a religious nut, and a jealous boyfriend. A touching film that should appeal to anyone who’s ever felt like an outsider, Edward Scissorhands remains Burton’s strongest overall work. It also allows Johnny Depp to do some of his finest acting, despite his lack of dialogue. This entry was posted on Friday, May 11th, 2012 at 5:19 pm and is filed under Good Movies, Thoughts on Film. You can follow any responses to this entry through the RSS 2.0 feed. You can leave a response, or trackback from your own site. Albert Finney really stole the show in Big Fish. I’m glad I didn’t know that was a Tim Burton movie at the time or it might have biased my opinion. Dark Shadows was good, but a little slow for my tastes. But if you ever saw that old soap opera, the film was moving at light speed by comparison.